Some soups are really good for fall, and some soups are NEXT LEVEL fall soup material. Jalapeño Lime Chicken Soup is casually coming to mind. In my book, to be NEXT LEVEL fall soup material, you need to have a few things. really amazing flavor. like, big. flashy. kind of obnoxious in a good way. for example, jalapeño. and lime. unlimited, open-ended, can’t-be-stopped topping options. a little salty, a little crispy, a little cooling, calming, and fresh. a nice long simmer. windows open, candle burning, good house smells. it’s just necessary. reheat-ability, because we’re going back to work and school now and bringing our lunches like responsible adults, okay? the filling factor, as in must not be hungry within five minutes of eating it. If you like spicy, big flavor. If you like topping options galore. If you like recipes that come together in a hot second. YOU CAME TO THE RIGHT PARTY. The soup, in a nutshell, is a kickin’ family-friendly meal (except probably not for, like, infants? unless they like jalapeños?). It is full of awesome flavors that will change up your soup routine. Chicken, white beans, and a salty/spicy kick, but with a cool and refreshing broth to simmer it all down. Honestly, I am tempted to use the term flavor explosion right now. 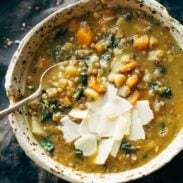 I know, I know, we’ve all been stuck in that chicken wild rice soup rut for a good while, and while I do love that creamy goodness for its own comfort food vibes, it doesn’t have the energizing powers of this green goddess. This is the one that will clear out your leftover head colds, make your eyes do the googly-pop thing, and give you a nice booty kick rev up your fall season. In Minnesooota, or maybe I should just say in my family, we’re not really known for loving spicy food. Jalapeño = just no. But in years past, this soup has been our extended family’s own holiday miracle: they’ve tried it and they’ve liked it. And I scooped up all the leftovers with tortilla chips, and squeezed on extra lime juice please and thank you, and lived happily ever after. 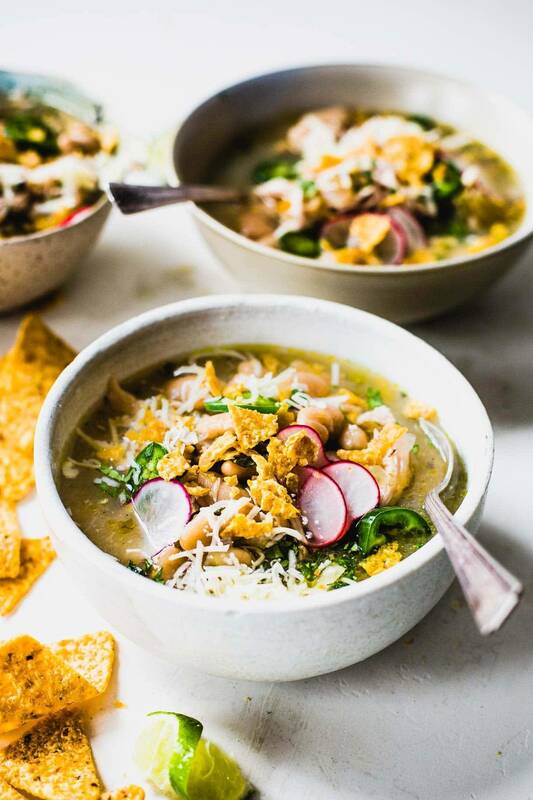 This simple and healthy Jalapeño Lime Chicken Soup has white beans, salsa verde, and a hit of fresh jalapeño and lime juice. In a soup pot over medium heat, saute the onion and jalapeno with the olive oil until soft and fragrant. Add the water and salt. Bring to a boil. Add the raw chicken breasts. Cover and cook for 5-10 minutes. Remove from heat, but leave the lid on so that the chicken continues cooking for another 20 minutes. Remove the chicken breasts, set aside to cool. To remove any unwanted chicken fat in the broth after Step 2, pour the liquid through a fine sieve, reserving the liquid. Return the liquid to the pot over medium heat. You can also do this by just scraping across the top to remove any chicken fat. This is also delicious served with white rice IN it, or as a side. It helps offset the spiciness. You are a genius with the jalapeno-food processor idea. I always use my hands…I have been victim of the whole watery eyes for 3 years thang way too often. Not so fun, and not so prettiful. This soup though. My face wants this. Needs this soup. Lately I am just putting everything in my food processor. I mean WHY NOT. I love it. Looks so YUMMY! Sorry but I didn’t see the tip for the jalapeno in the food processor. Mmm… I might be a fan of bean soups but you got me with the Jalapenos; I am addicted to the little peppers especially in such a healthy soup. Really lovely post and recipe! That is one gigantic pot of soup. It is a snow day today and I really want to make a soup for lunch. This would be perfect! This soup looks delicious – and warm, which we need right now! NO WAY – and here I thought we were the only crazy ones. Because everything IS better with cheese! This looks like something the husband would like for sure but I might have to keep a seperate pan pepper free for kiddo. While we love spice, at 9, she’s not. Good question – if 1 is macaroni and cheese and 10 is … something really spicy, I’d give it a 5 or 6. I consider this mild+, bordering on medium. If you leave the seeds and ribs in the jalapeno, it will be VERY spicy. But the recipe directions are to remove them so the jalapeno doesn’t give off all that much heat IMO. It also depends on what kind of salsa verde you use, so if you buy mild, obviously, it will not be as spicy. I loveee the idea of jalepeno and lime together. Oh gosh, this sounds and looks incredible Lindsay! I tried your wild rice soup and loved it – 5 stars for sure! If there’s a jalapeno involved, I am all-in! Thanks for this great recipe. I can always find a reason to pick up a jar of salsa verde. ooh, try the Guy Fieri kind if you can find it. It was my favorite! I haven’t felt like cooking since Thanksgiving!! Hope I get the urge soon, because I have to have this!! I LOVE spicy food and although I’m in the midwest as well, jalapenos are a must!!! Fantastic recipe! I just hate that, when cooking becomes blah. I had a major season of that around Christamstime since I was really sick. Hope this gets you back in the kitchen and feeling good, Tanya! 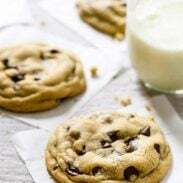 So that sounds absolutely delicious and I want some in my tummy right now…especially since I think I have frost bite from this dang weather! FABULOUS- I am always looking for a new tasty soup. YUM. I was going to make something else for dinner tonight until I saw this photo. This tastes as great as it looks and my husband loves it!! ooh yay! I love when people make the recipes right away. Glad you like it Barbara! This soup looks amazing! I’m glad your family branched out and tried it, how could you not like this?! Lindsay, are you just lucky enough to have fantastic natural light in your new kitchen, or are you using artificial lighting? The lighting in my kitchen is terrible. I am trying to decide between a speedlite or just moving one of my studio lights into the kitchen (my very small kitchen) for process shots! A post on artificial light would be awesome Lindsay. I live in Alberta and our sunshine hours are just not cooperating with me at all lately. Looks delicious. We make a chicken tortilla soup w Jalapeños (sometimes Habaneros but those can be really spicy!) This is definitely a keeper. Love your food pictures btw, gorgeous stuff! I think we all needed a nice break for the holidays! This soup looks so perfect! Bring on the Jalapenos! I love them and the little kick of lime and sprinkle of cheese. Totally my kind of bowl! Yes. I am not a huge jalapeño person either but this looks to diiiiiie for. Love the fresh-squeezed lime and I’m a huge fan of canellini and salsa verde. Pinning! @lindsay – just joined FBP Lindsay excited to take your course! Great! Welcome and looking forward to seeing more of you over there Alexis! I love black beans though– do you think they would work instead or no? If I didn’t have to go out in public to walk my dog or grocery shop, I’d probably never change out of my PJs! Cozy comfort clothes >> stuffy business attire. 😉 Your soup sounds amazing! We’re big fans of spicy food at our house, but with only 2 of us, I doubt we’d want 6 days of leftovers… Does the recipe halve easily? Yep. I just made the big batch since I was feeding a big crowd, but I’ve since made the half batch just using about a pound of chicken and it works great. This has my name written all over it! I’m obsessed with lime anything right now, so this totally fits the bill. I’ve registered for a food processor on our wedding registry…having to wait until next September is killing me!